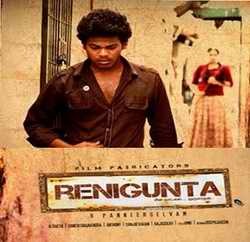 The controversial Paneerselvam directed Renigunta which was referred to Revising committee in Mumbai has now been cleared with an A certificate with cuts. The film was refused a censor certificate by the Regional Censor Board in Chennai for showing violent and gruesome scenes enacted by children in graphic detail. A censor spokesperson said: The members who had recently watched the film congratulated the filmmaker for making an overpoweringly stunning film. The film will now release in grandeur on December 4 . Just after the deadlock with Censor Officials in Chennai was cleared and the the film was cleared for screening by Mumbai censors, Uttam Chand, a financier who has financed the movie filed a petition in Chennai High Court seeking a ban on the movie's release since the producers failed to pay off the debts. The Court, after hearing the petition, ordered the movie's screening to be withheld until the producers pay their debts Rs. 37 lakhs with 24% interest to financier Uttam Chand.